I was lucky enough to be chosen as a favourite at the Retro Rubber Challenge a while back and so I'm joining them as a guest designer on the current challenge which has just gone live here. The idea at RR is to show some love to stamps that are at least a year old so it's a great chance to look back over your stash for toys you might have ignored for a while! It's a tic-tac-toe challenge this time, see the end of this post or visit the Retro Rubber blog for the grid if you'd like to play along! I chose the middle column of the grid: sparkle-leaves-heat embossing. I embossed the sentiment with a detail white powder and then smooshed on some ink using a piece of acetate. The oak branch stamp has acorns on it which means it always seems to be an autumnal kind of image but I thought that if I coloured the leaves green and only used part of the image it would be more suited to spring and summer. The sparkle comes courtesy of my "go to" embellishment when I want just a touch of glitz: nail art gems. Here's the tic-tac-toe grid, why not head over and play?! 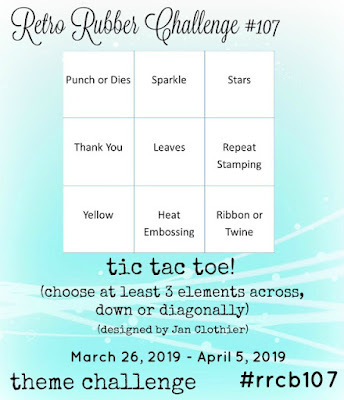 Hello Joanne: Thank you for being our Guest Designer over at RETRO RUBBER for our Tic Tac Toe challenge. Your card is stunning and perfectly CAS, those leaves look so real that one might think you went outside to pluck them from a real tree. Love the blue watercolor wash and the way you framed your sentiment. Thank you again for being our Guest Designer and I hope you continue to share your beautiful cards with us. So pleased to have you along as guest designer, Joanne. I love the contrast between the blue and green, and the loose watercolour background against the realistic looking leaves. They are stunning on their own! Hey! Congrats on being a guest designer! I agree. I did think you had used real leaves at first glance. This is just beautiful! 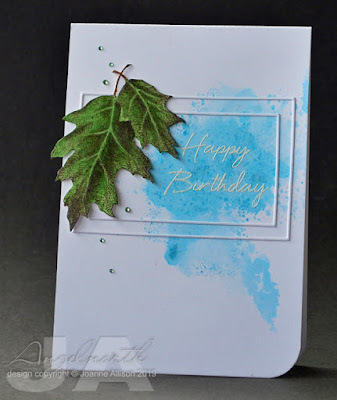 Those leaves look so REAL, love the watercoloring, the whole card just has a wonderful organic feel to it! SO happy to have you as a Guest Designer this week too! 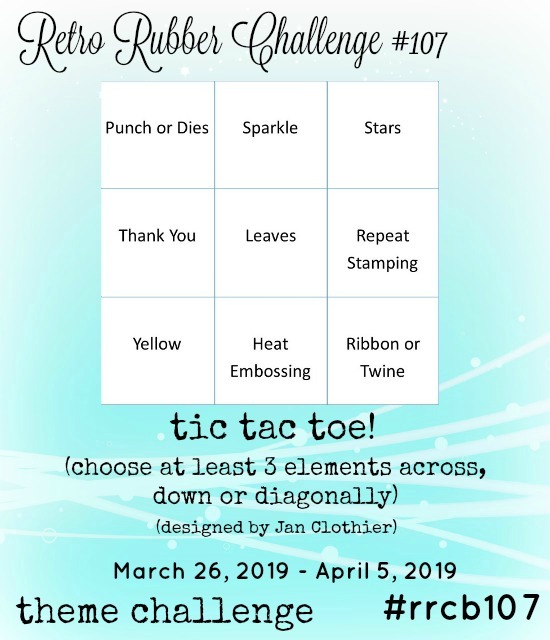 Amazing job with the Tic Tac Toe, and thanks for being our GDT for this challenge at Retro Rubber. Your leaves look so real, and the simplicity of the card really sets them off nicely!